A study in violence and pop hoodlum cool, Quentin Tarantino's debut film adrenalized the gangster film and put Tarantino on the auteur map. Adapting the novelistic structure of Stanley Kubrick's The Killing (1956) and using observational long takes, Tarantino shifts between the preparations for an ill-fated heist and its extraordinarily bloody aftermath, increasing tension through the gradual revelation of each color-coded character's true nature as they figure out what went wrong. As in Howard Hawks's and Sam Peckinpah's films, the driving concern is honor among men, but, as in the films of Jean-Luc Godard, Tarantino's crooks also define themselves through a plethora of pop culture references, from Lee Marvin to the "Stuck in the Middle With You" ear-slicing and the opening exegesis of Madonna songs. Drawing praise and fire on the film festival circuit for juxtaposing humor and brutal violence, and attacked for being too indebted to the Hong Kong action film City on Fire (1987), Reservoir Dogs opened to critical acclaim, jump-starting former video clerk Tarantino's career. 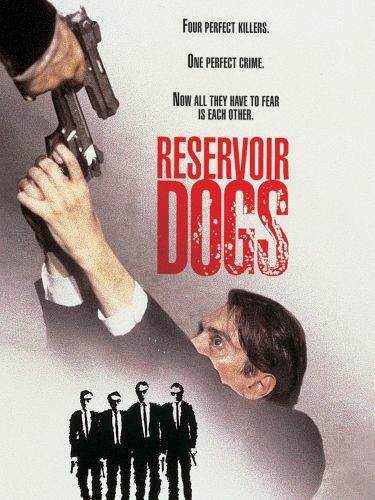 Although its extreme bloodshed hampered its box office, Reservoir Dogs's postmodern generic self-awareness went on to be almost as influential on 1990s gangster movies as Tarantino's next film, Pulp Fiction (1994).